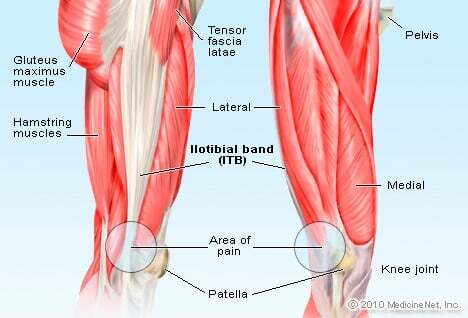 What causes iliotibial band (IT band) syndrome? What are iliotibial band (IT band) syndrome symptoms and signs? How do health care professionals diagnose iliotibial band (IT band) syndrome? What is the treatment for iliotibial band (IT band) syndrome? What stretches and exercises are beneficial for iliotibial band (IT band) syndrome? What exercises should be avoided with iliotibial band (IT band) syndrome? Where can people find more information about iliotibial band (IT band) syndrome? Physical therapy may be helpful. Surgery is rarely an option but is sometimes suggested for patients who develop chronic inflammation and who fail to respond to other treatment options. Prevention includes maintaining flexibility and strength of the low back, hips, knees, and leg muscles, and is key to avoiding recurrence. 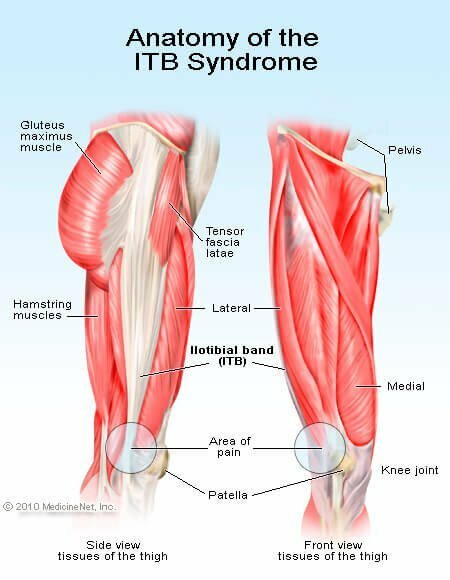 Iliotibial band syndrome is sometimes called ITBS, IT band syndrome, ITB syndrome, and ITBFS (iliotibial band friction syndrome). The iliotibial band is a thick band of fascia (tissue) that begins at the iliac crest in the pelvis, runs down the lateral or outside part of the thigh, and crosses the knee to attach into the top part of the tibia or shinbone. It forms from the tensor fascia lata and two of the gluteal muscles (gluteus medius and gluteus minimus) in the buttock and then stretches across the knee. The iliotibial (IT) band helps stabilize the outside part of the knee through its range of motion. The iliotibial band is one of the hip abductor muscles, moving the hip away from the midline. The iliotibial band also helps with both knee flexion and extension. When the knee is flexed, the IT band is located behind the femoral epicondyle, a bony outcropping of the femur or thighbone at the knee joint. The IT band moves forward across the condyle when the knee is extended. There is a sac or bursa that allows the band to glide smoothly across the condyle, but should inflammation occur in this area, the increased friction from repeatedly rubbing the iliotibial band across the bony condyle can cause pain, especially along the outer (lateral) aspect of the knee joint. If the symptoms are ignored, the inflammation can continue and scarring develop in the bursa, decreasing knee range of motion and causing increasing pain with decreasing activity. Knee pain can be a result of injury or disease of the knee joint. Injury can affect any of the ligaments, bursae, or tendons surrounding the knee joint. Injury can also affect the ligaments, cartilage, menisci (plural for meniscus), and bones within the joint. Pain can also occur in the knee from diseases or conditions that involve the knee joint, the soft tissues and bones surrounding the knee, or the nerves that supply sensation to the knee area. Overuse injury to the knee can lead to inflammation of the tendon below the kneecap (runner's knee or jumper's knee with infrapatellar tendinitis) and bursitis. Iliotibial band inflammation is an overuse syndrome that occurs most often in long-distance runners, bicyclists, and other athletes who repeatedly squat. The iliotibial band syndrome may be the result of a combination of issues, including poor training habits, poor flexibility of muscle, and other mechanical imbalances in the body, especially involving the low back, pelvis, hips, and knees. There can be a predisposition to develop IT band syndrome. Anatomy issues may include differences in the lengths of the legs (a leg-length discrepancy), an abnormal tilt to the pelvis, or bowed legs (genu varum). These situations can cause the iliotibial band to become excessively tight, leading to increased friction and irritation when the band crosses back and forth across the femoral epicondyle during activity. Training errors may cause runners to develop iliotibial band syndrome symptoms. Roads are canted or banked with the center of the road higher than the outside edge to allow for water runoff. If a runner always runs on the same side of the road, it produces the same effect on the body as having a leg-length discrepancy. One leg is always downhill compared to the other, and the pelvis has to tilt to accommodate the activity. Running too many hills can also cause inflammation of the IT band. Running downhill is especially stressful on the IT band as it works to stabilize the knee. Bicyclists may develop IT band inflammation should they have improper posture on their bike and "toe in" when they pedal. The issue may be how the toe clips are aligned, forcing the foot to be internally rotated, toed in. 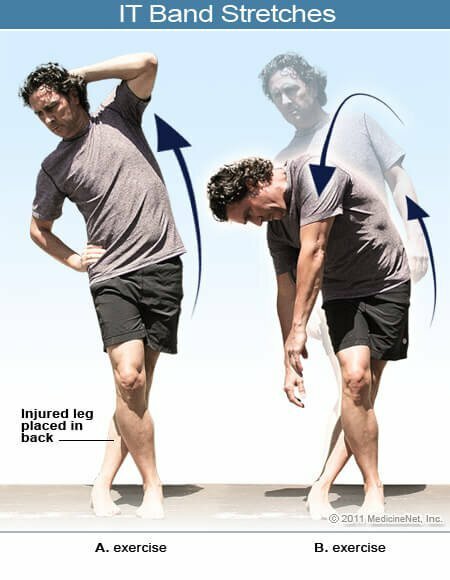 This can cause the same effect as bowed legs, increasing the angle of the IT band as it crosses the knee and increasing the risk of inflammation. Other activities with increased knee flexion can cause symptoms and include rowing and weight lifting, especially with excessive squatting. Pain on the lateral side of the knee is the most common symptom of iliotibial band syndrome and is due to inflammation of the area where the band crosses back and forth at the femoral epicondyle. Initially, there may be a sensation of stinging or needle-like pricks that are often ignored. This can gradually progress to pain every time the heel strikes the ground and finally can become disabling with pain when walking or when climbing up or down steps. Some patients may feel a snapping or popping sound at the knee, and there may be some swelling either where the band crosses the femoral epicondyle or below the knee where it attaches to the tibia. Occasionally, the pain may radiate along the course of the IT band all the way up to the outer side of the thigh to the hip. Often, the diagnosis of iliotibial band syndrome can be made by the patient's story of symptoms. The patient describes the progression of lateral knee pain that is made worse when the heel strikes the ground. Physical examination is helpful because the area of pain can often be palpated with tenderness and swelling felt over the femoral epicondyle, where the bursa or sac is located. The health care professional may also look for leg-length discrepancy, muscle imbalance, and tightness in the legs and back. There is tenderness of the outer thigh just above the knee joint, while the knee and hip joints themselves are normal to examination. Usually, a full physical examination of the low back and legs, including the hips, knees, and ankles, is performed to detect other potential causes of lateral knee pain. Plain X-rays are not usually required to help with the diagnosis, but MRI may be used to look for inflammation surrounding and beneath the iliotibial band. The MRI can also exclude other causes of outer knee pain. These include torn cartilage (lateral meniscus tear), sprained lateral collateral ligament, muscle tendon inflammation, and problems between the kneecap and the femur (patellofemoral pain). Most often, X-rays and MRI images are not needed. Iliotibial band syndrome is an overuse injury that causes inflammation. Initial treatment includes rest, ice, compression, and elevation (RICE). Anti-inflammatory medications, like ibuprofen (Advil, Motrin) and naproxen (Aleve), may be helpful. Note that any over-the-counter medications can have potential side effects, as well as interactions with prescription medications. If questions or concerns exist, it is wise to ask a health care professional or pharmacist about their safe use. Home treatment can involve stretching, massage, and use of foam rollers at the site of pain and inflammation. Should these first-line treatments not work, physical therapy may be needed to decrease the inflammation at the IT band. Some treatments focus on flexibility and stretching. Friction rubbing may occur over the IT band at the femoral epicondyle may help to break down inflammation and scarring. Therapeutic ultrasound techniques may be used, including phonopheresis (ultrasound propels anti-inflammatory medications through the skin into the inflamed tissue) and iontophoresis (electricity is used instead of ultrasound) to help decrease irritation in the soft tissues surrounding the knee. The physical therapist may also help evaluate the underlying cause of the problem and look at muscle strength and balance and/or flexibility and gait analysis (watching a person walk, run, or cycle). Shoe orthotics may be useful if there is a gait problem, pelvic tilt, or leg-length discrepancy as a potential cause of IT band syndrome. Corticosteroids (dexamethasone, methylprednisolone, hydrocortisone) injected at the site of inflammation may be of benefit. Research continues with other injection therapy options to find non-surgical cures. It is unusual that the conservative nonsurgical treatment fails to help. However, orthopedic surgery may be an option for patients who fail conservative (nonoperative) treatment. Arthroscopy can be used to find the inflammation surrounding the iliotibial band and cut it away. This inflammation and scarring is often found in the lateral recess of the knee between the IT band and the femoral epicondyle. Other surgical options may be available, including cutting out a small triangular part of the IT band to lengthen the band and allow more room for it to slide across bone. Before surgery is considered, other potential causes of lateral knee pain are usually considered. These include lateral meniscus tear and chondromalacia. Most patients recover from iliotibial band syndrome, but it can take from weeks to months to return to full activity without pain. Patience in allowing the body to heal is required for optimal results. Understanding the importance of symmetry in the body is helpful in preventing iliotibial band syndrome. When activities alter that symmetry, symptoms may occur. Symptoms may occur in runners who always run in the same direction on an indoor track or who always run on the same side of a banked road. This causes an artificial tilt to the pelvis and increases the risk of developing inflammation and pain. When running indoors, it is wise to change directions when running longer distances. Some tracks have the runners change directions every few minutes while others change direction on alternate days. While running toward traffic is an important safety strategy, finding a way to run on the opposite side of the street safely may minimize the risk of developing iliotibial band syndrome. Bicyclists are at risk for iliotibial band syndrome if they tend to pedal with their toes turned in (internally rotated), which can cause abnormal stretching of the iliotibial band at the knee. Being aware of pedaling technique and setting the pedals and clips properly may minimize the risk of developing symptoms. Keeping muscles and other structures stretched is an important part of prevention of many musculoskeletal injuries, including iliotibial band syndrome. Iliotibial band syndrome is a common runner's affliction. Often a local running store will be able to provide information about the signs and symptoms of the injury, including area health care professionals who can help runners and other athletes. Baker, R.L., and M. Fredericson. "Iliotibial Band Syndrome in Runners: Biomechanical Implications and Exercise Interventions." Physical Therapy and Rehabilitation Clinics of North America 27.1 February 2016: 53-77. Lavine, R. "Iliotibial Band Friction Syndrome." Curr Rev Musculoskelet Med. 3.1-4 Oct. 2010: 18-22. Strauss, E.J., et al. "Iliotibial Band Syndrome: Evaluation and Management." J Am Acad Orthop Surg. 19.12 Dec. 2011. What were your symptoms associated with iliotibial band syndrome? How was your IT band syndrome diagnosed? What was the treatment for your IT band syndrome? What exercises and/or stretches did your doctor or physical therapist recommend? Arthritis, bursitis, IT band syndrome, fracture, and strain are just some of the causes of hip pain. Associated symptoms and signs include swelling, tenderness, difficulty sleeping on the hip, and loss of range of motion of the hip. Treatment depends upon the cause of the hip pain but may include anti-inflammatory medications and icing and resting the hip joint. In popular usage, the leg extends from the top of the thigh down to the foot. See a picture of the Leg and learn more about the health topic.